Pakistani, Indian and Persian food are obvious examples of cuisines that have evolved from numerous geographies. It's easy to compartmentalise food based on geographical borders, but on taking a step back, the story is wholly different: invaders and settlers have dictated cuisine over the years. It is on this premise that the founders of Bib Gourmand success Gunpowder have just opened their latest venture—Madame D, above a bar on Commercial Street. You will be utterly disorientated if you go thinking you will be eating the type of Indian food on offer at Gunpowder. The food cannot—and should not—be pigeon-holed to a specific cuisine; it’s more “cuisine from the Himalayas”, which, the last time we looked at a map, could be anything from the Indian subcontinent to the Tibetan plateau. Keeping it broad and borderless gives Madame D many options with which to tempt diners and experiment, and also asks for an element of openness from its patrons. 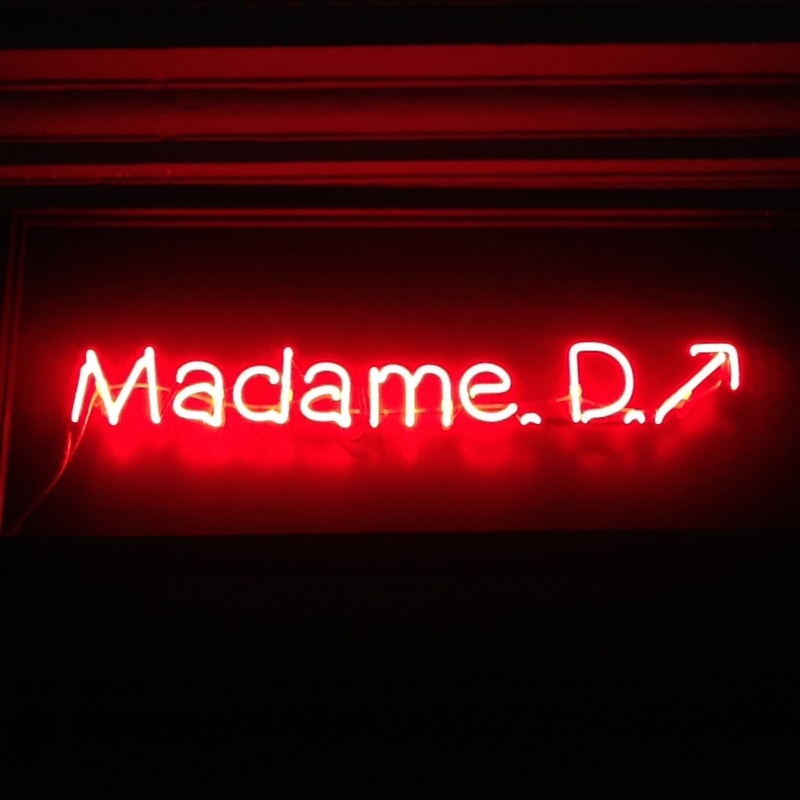 An inventive backstory has been created around Madame D to “set the scene” before diners arrive. With immersive theatre and secret cinema being all the rage, this idea is definitely on point. The story goes that Madame D was an opium smuggler from China who made her way through Tibet and Nepal, and then finally to Calcutta in India. It was here that she sold her last batch to a smuggler in return for her safe passage to London. She now resides here in a small apartment in the East End, where she cooks the food of her homeland, or the type of food that Chinese-Tibetan immigrants would cook in Calcutta: Hakka cuisine. The “flat” is sparse and a little cramped, with a map of the Himalayas above the fireplace sitting alongside a golden cockerel—a nod to Madame D’s Chinese heritage. Candles flicker and there is an expectant buzz in the room. It feels like a cross between a secret supper club and pop-up. There is a no-reservations policy so diners have to chance their luck upon arrival. The downstairs bar provides the perfect waiting room until space becomes available upstairs in the “flat”. Three key ingredients weave their way through the menu: chilli, spring onions and garlic. Flavours and textures are the hallmarks of Hakka cuisine. This came through in all the dishes from the satisfying crunch of the Himalaya fried chicken with the accompanying zingy vinegar dipping sauce, to the umami tasting tiffin masala lamb noodles with fried egg. Both satisfying and utterly addictive. The Naga chilli beef puffs were flaky cubes of puff pastry with spiced beef mince in the centre—an Asian equivalent of a Cornish pasty, but more moist. Perched on wooden stools, we shared our table with some adventurous Italians. Although we differed in our menu choices, it was unanimous that the kitchen delivered on flavour, originality and heat, and that the unexpected was part of the fun. Crispy cubes of Hakka chilli paneer, scattered with spring onions and garlic, were reason alone to return. Stuffed aubergine with mushrooms were cooked whole and the flesh softened so that it could easily be broken up, even with chopsticks. It was coated in a thick, spicy sauce sprinkled with nuts, adding a welcome dimension. Of course, Himalayan cuisine isn’t complete without a serving of momo—steamed dumplings filled with lean mince, or in our case duck—smothered in a delicately sweet chilli sauce. Although spicy, it’s refreshing to eat the type of food prepared by Chinese-Tibetan immigrants in India (and in the East End of London). Go with an open mind, an empty belly and a love for chilli. Opening hours: Tuesday-Saturday, dinner 6pm-late. No reservations.